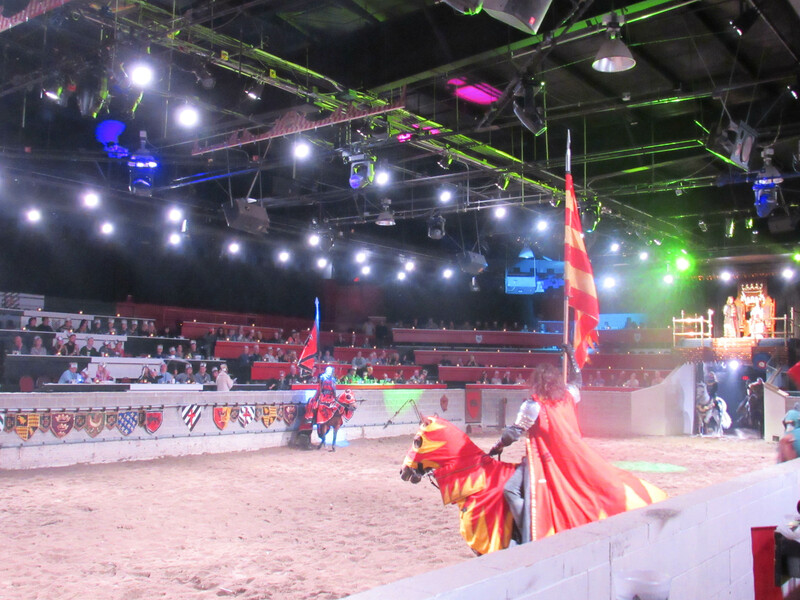 Early Christmas Gift to Medieval Times Dinner & Tournament + Giveaway! I don’t know about you, but I find my kids get a ton of toys at Christmas. Between us, the grandparents, and our aunts and uncles, it sometimes gets to be too much. That’s why every year we scale back on the toys, and take the kids out somewhere fun and exciting as an early Christmas gift. 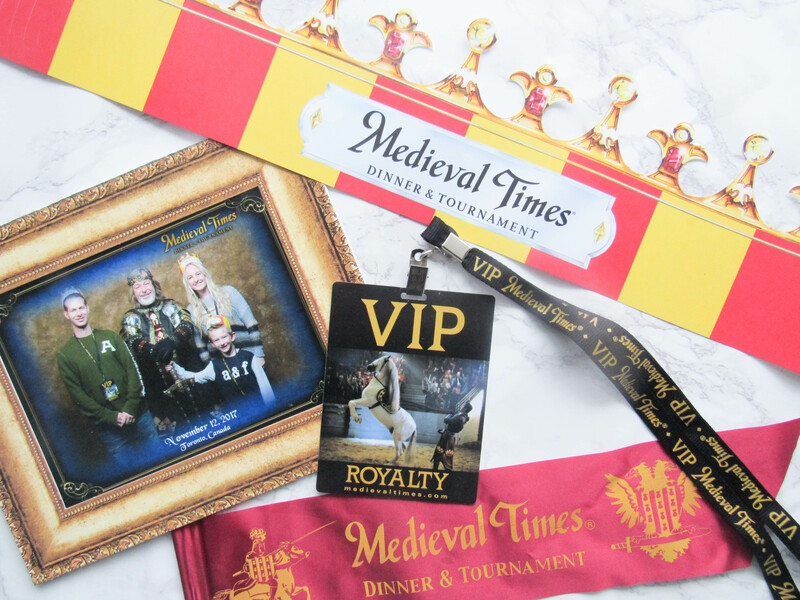 This year, we decided to surprise our son with VIP tickets to Medieval Times Dinner & Tournament. Since our daughter is only 3, we thought she wouldn’t enjoy it as much, so we plan on doing something else for her later this week. Being that my son is in school now, it was actually really nice to get that one on one time with him, since it doesn’t happen often. My daughter gets a lot of time with us during the day, because she isn’t in school full-time yet. 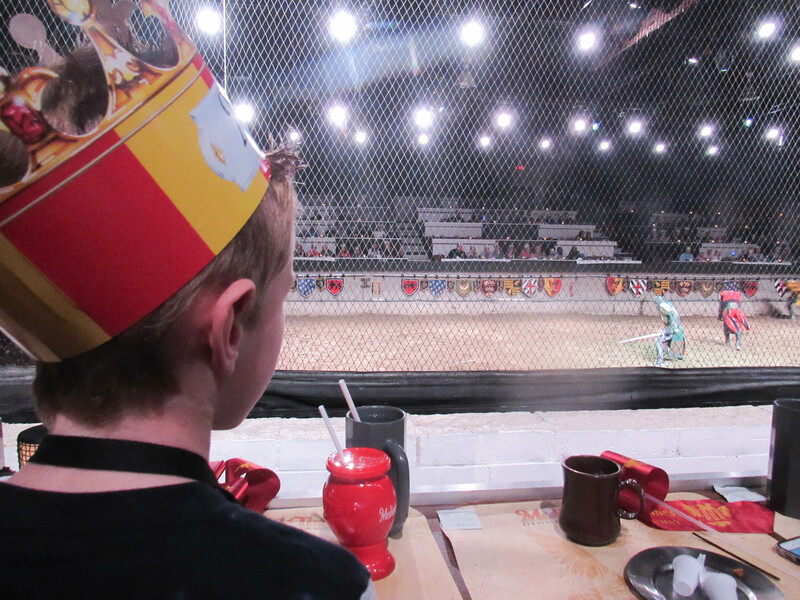 This is my son’s second visit to Medieval Times. 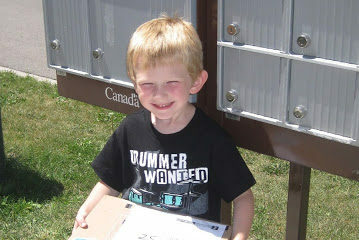 We took him a couple of years ago, and we remembered how much he loved it, and decided to take him again. 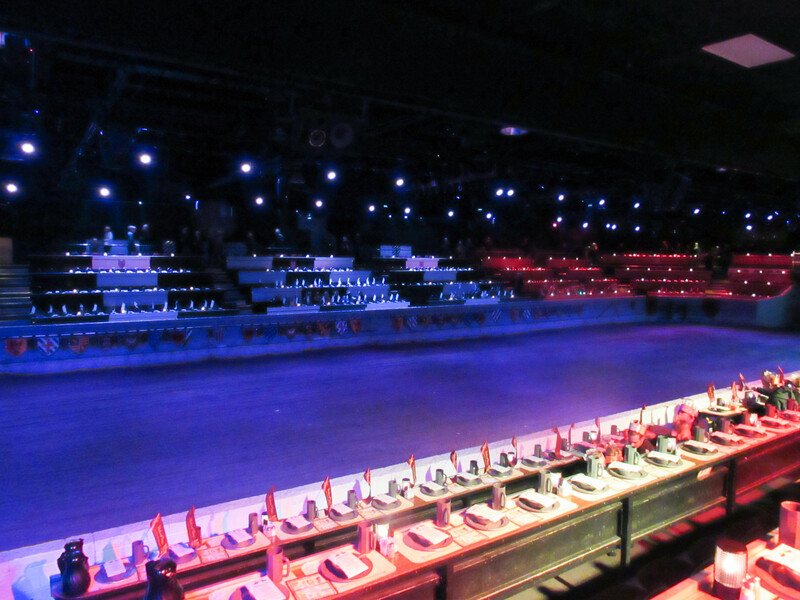 We made sure we arrived nice and early, because there is lots to do before the show, and we didn’t want to be rushed. 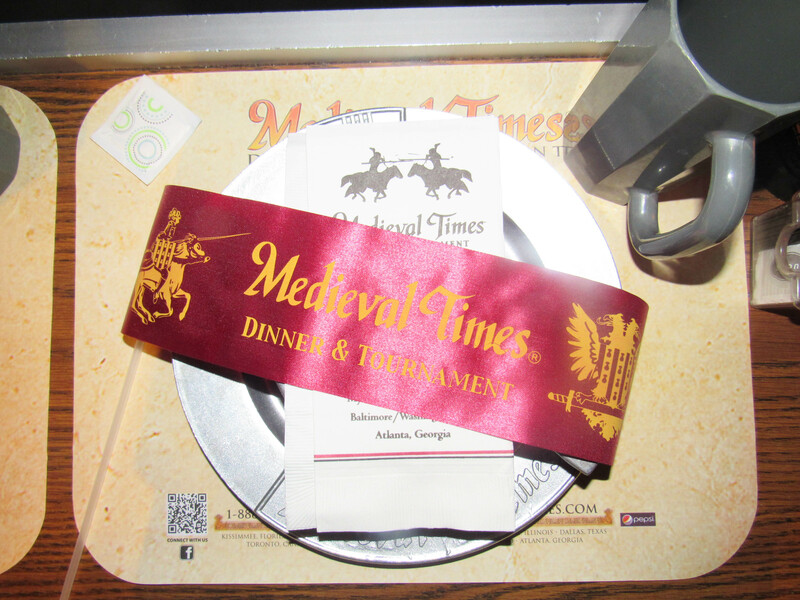 As soon as we arrived, we were greeted as “Lords” & “Ladies” and then headed over to a table to pick up our VIP passes, and crowns. 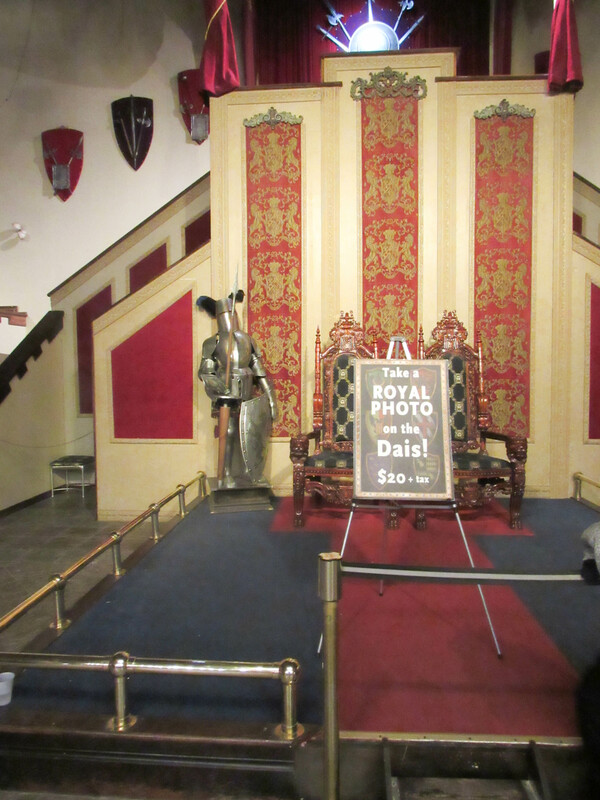 We also had the option to get our picture taken with either the King, or the Queen before the show too. 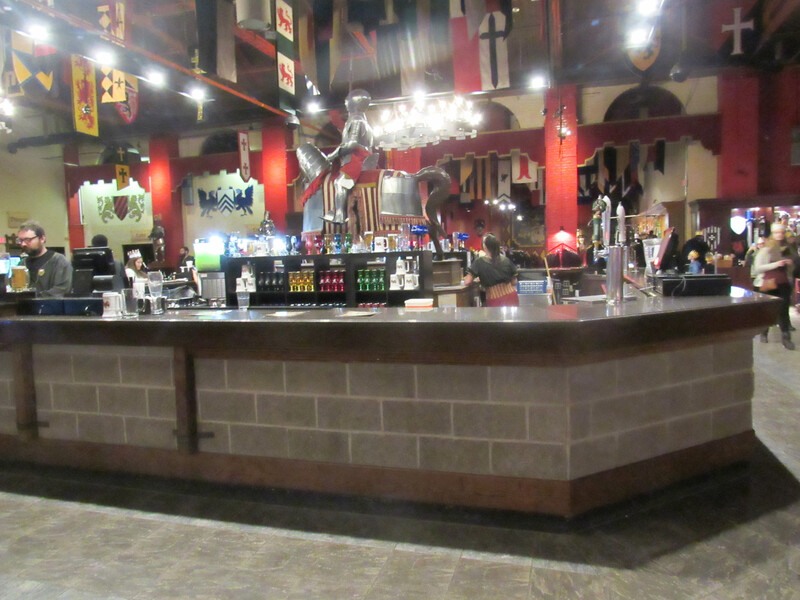 Once we were done checking in, we got some drinks at the bar, and watched a pre-show that they had going on. 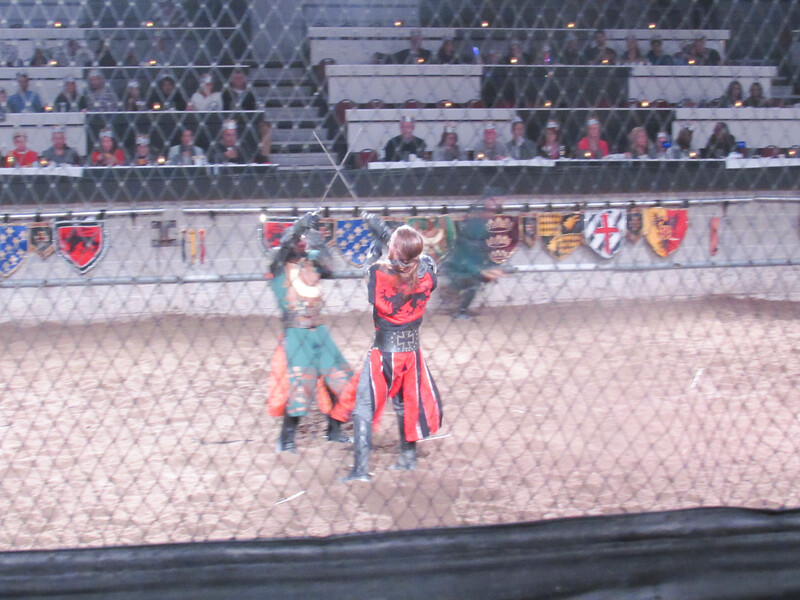 People who were celebrating a birthday were “Knighted” in front of us all. 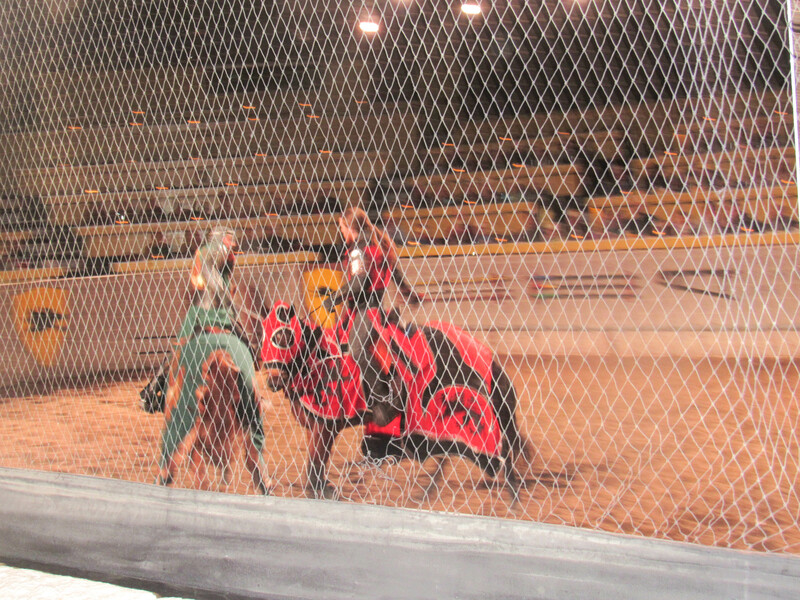 They also have an area to view all the horses, so we went and checked that out as well. 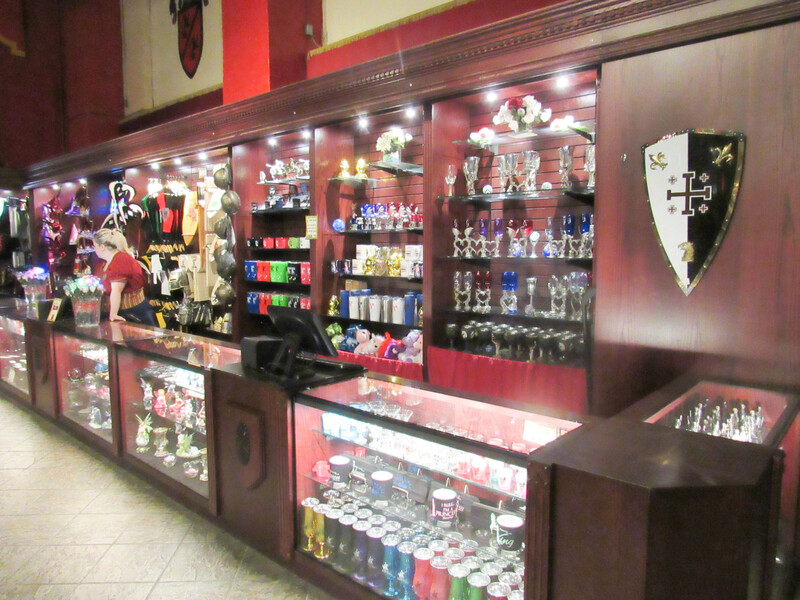 There is a ton of souvenirs to purchase, and of course our son wanted a “light up” sword so we got him one. He is still playing with it everyday when he gets home from school- he loves it! 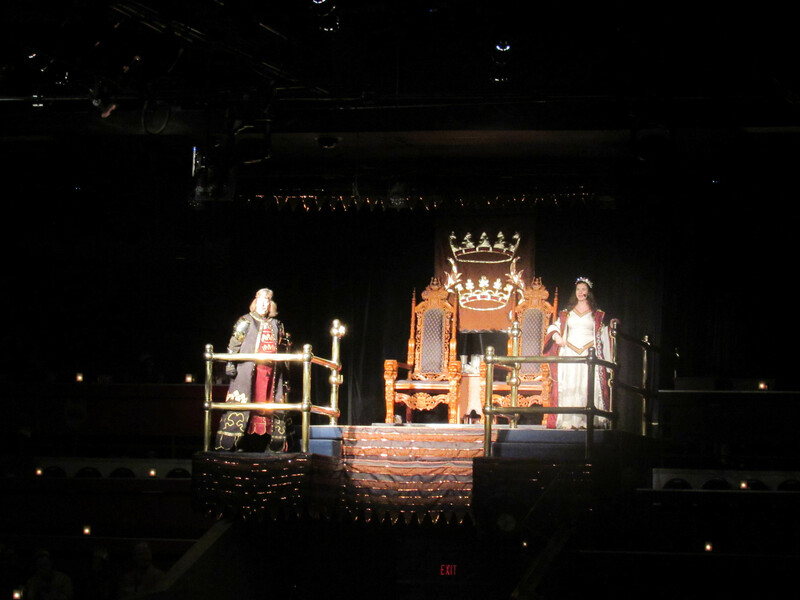 We got the Kings Royalty Package, which gave us front row seating, and we lucked out even more because we were also in the centre. Amazing seats! It also included our family photo in a beautiful keepsake frame. I highly recommend upgrading – it’s so worth it!! Each section is divided by colour. 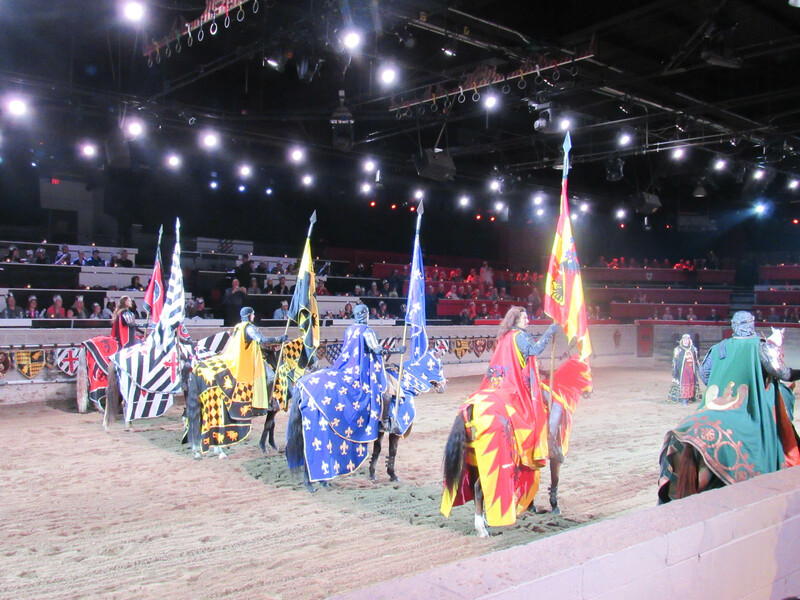 The colour of your crown indicates which section you will sitting in, and which knight you will be cheering for. 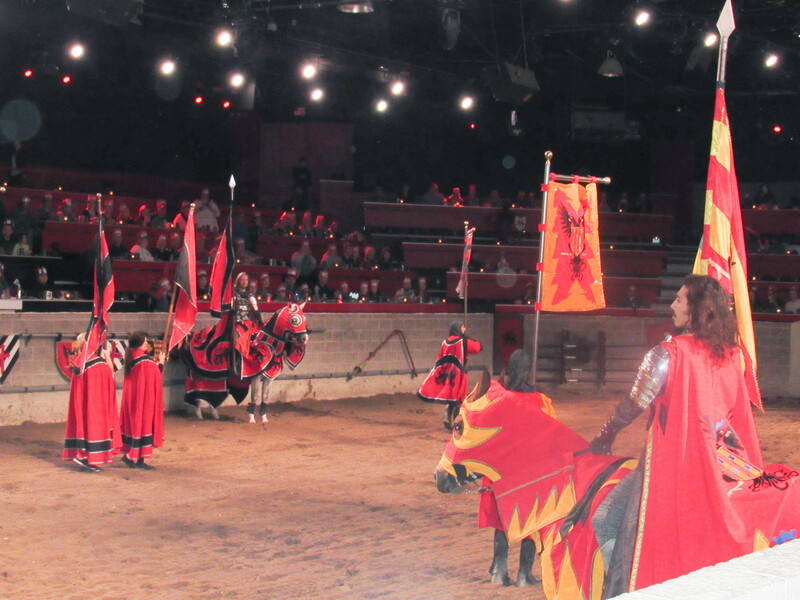 Since our crowns were yellow, and red, we sat in that section and cheered for that Knight. We also got flags to help us cheer! 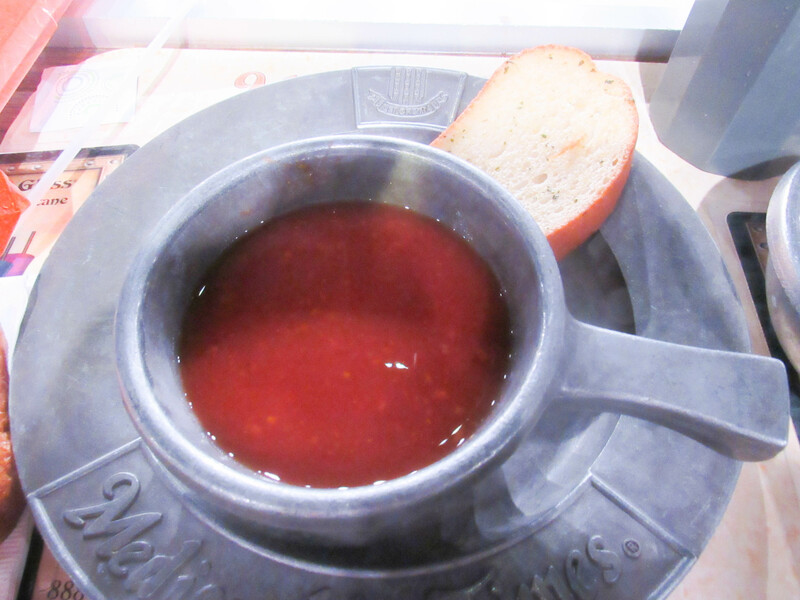 For dinner, we had tomato soup and garlic bread to start, followed by our main course which was a 1/2 chicken, potato and corn. For dessert, we got a slice of pie. The food is soooo good! Plus, you get so much!! 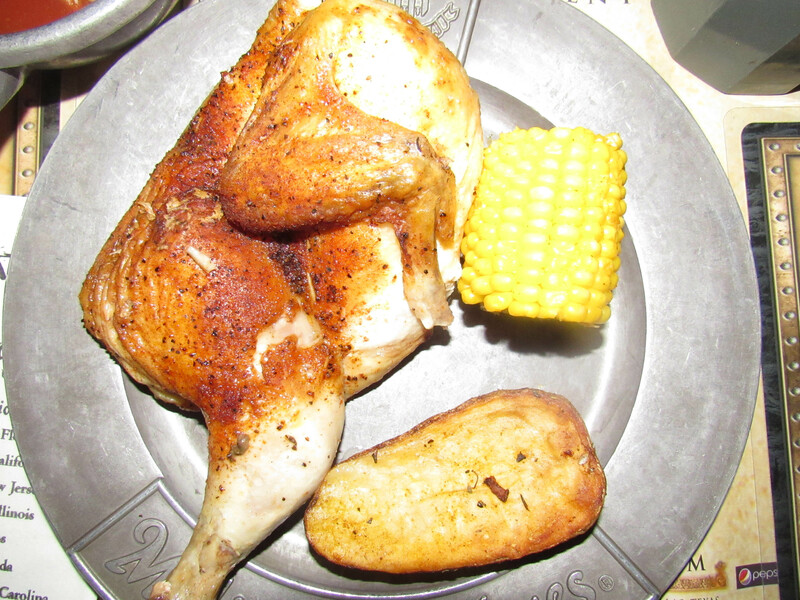 Everything is eaten without utensils, but I believe you can request a fork if you rather not use your hands. 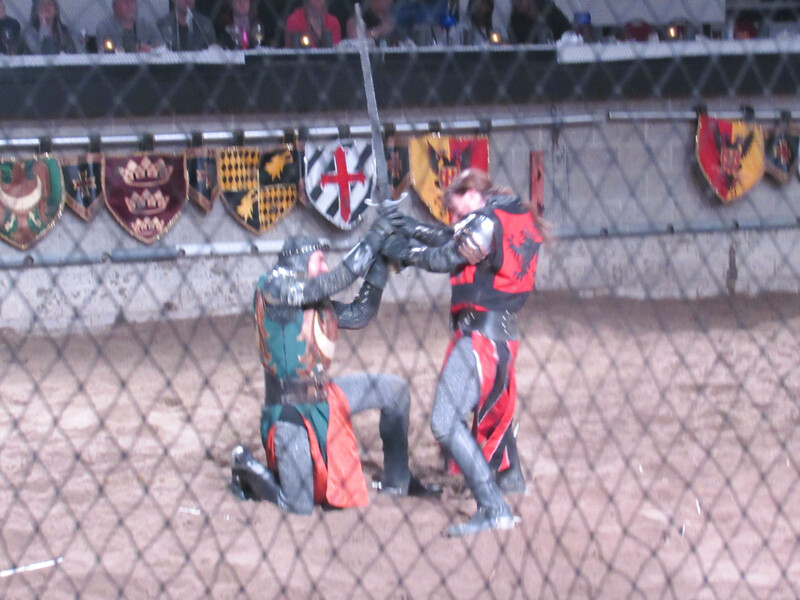 Of course my son’s favourite part was the sword fighting. 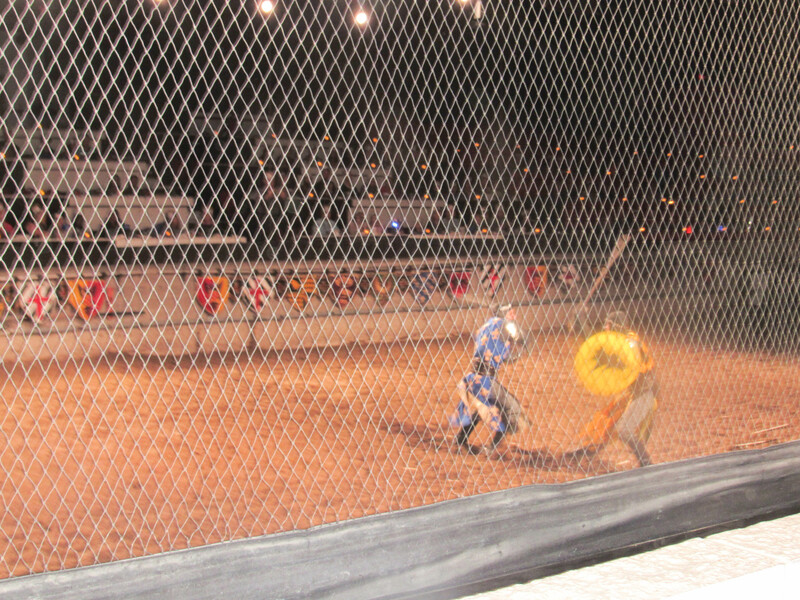 He loved how the mesh screen came down in front of us to protect us, and he loved seeing the sparks from the swords. Such a great show, and a perfect night spent together! 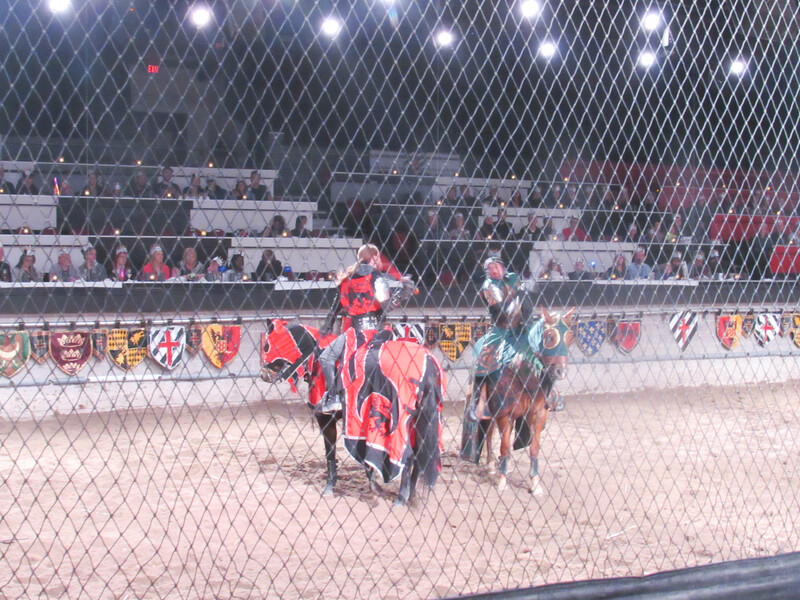 When the show was over, some of the knights came out for pictures. 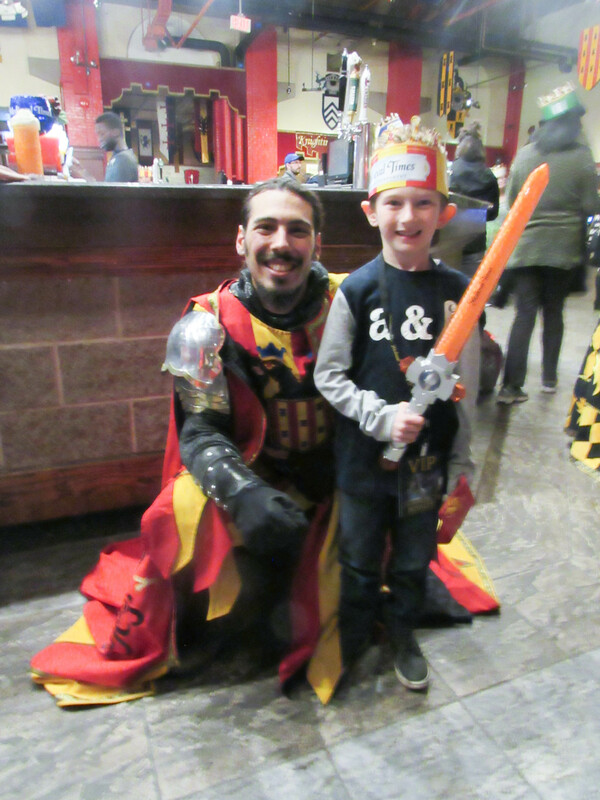 Even though our knight didn’t win, our son still wanted to get a picture with him at the end. 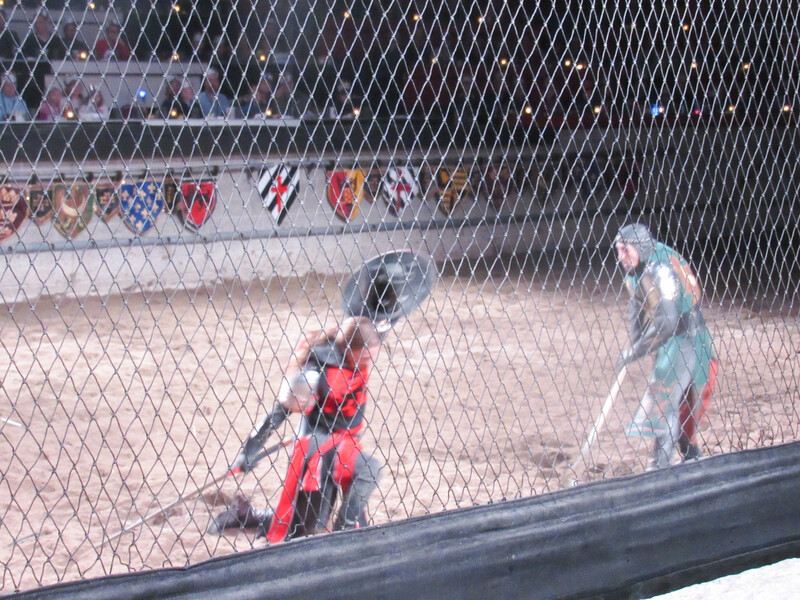 And of course, he had to show off his new sword! 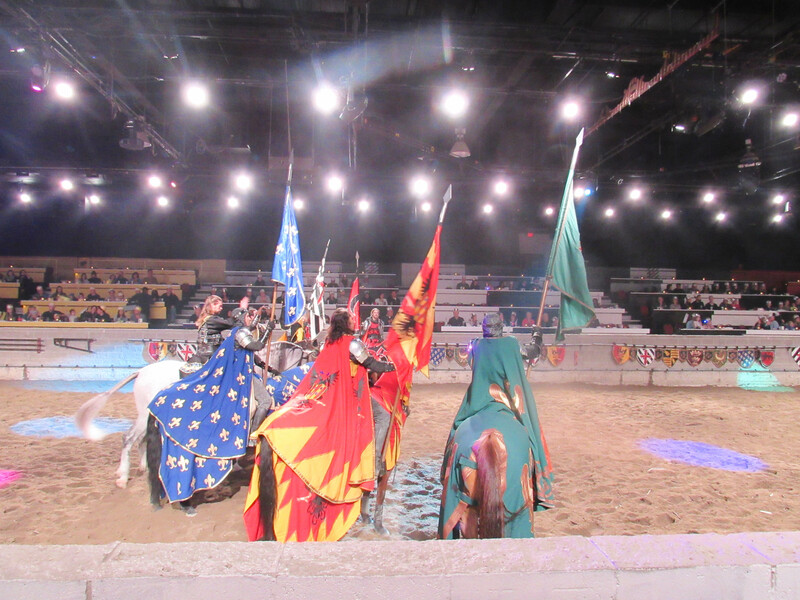 If you’re looking for a last minute Christmas Gift, getting tickets to a Medieval Times show is a great option. 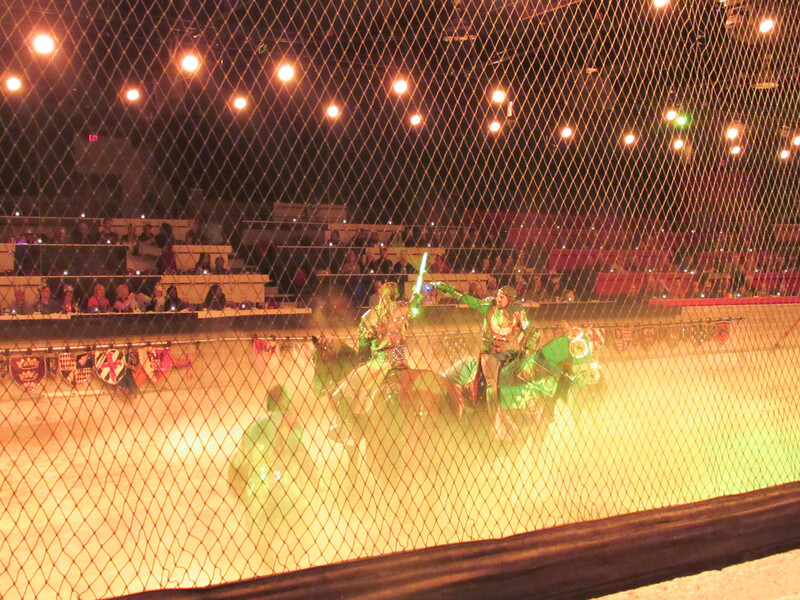 It’s such a fun event that the whole family would love. Would you like to win tickets to a show??!! 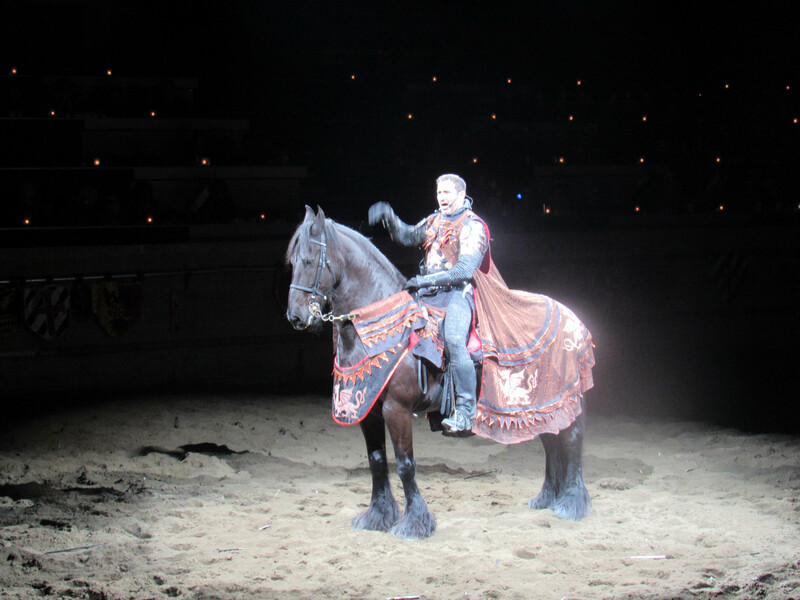 I am giving away 4 General Admission Passes to a Medieval Times show in Toronto to one lucky reader. All you have to do is enter via Rafflecopter below. One winner will randomly be chosen via the Rafflecopter App. This contest starts today, Monday, December 11th, 2017 and closes on Sunday, December 17th, 2017 EST. Winner will be selected randomly and announced on Monday, December 18, 2017. This contest is open to Canadian Residents Only. 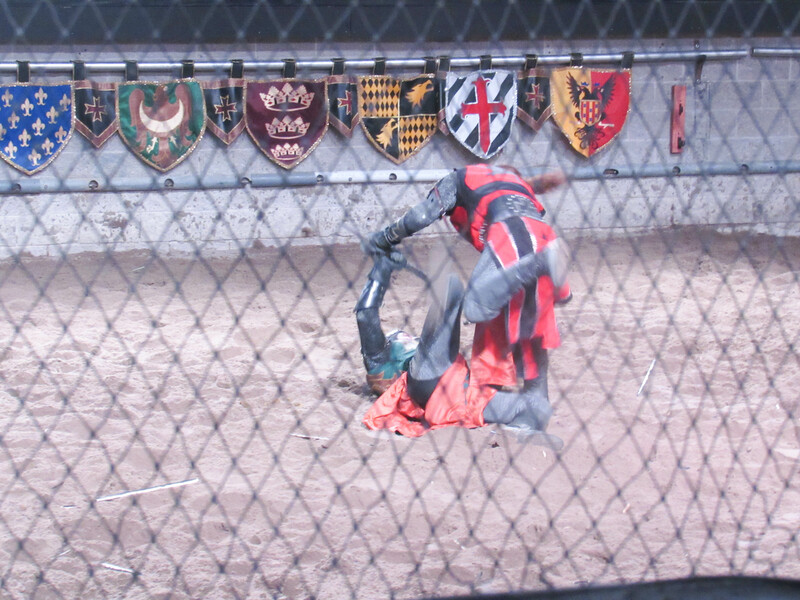 Disclaimer: Thanks so much to Medieval Times Dinner & Tournament for collaborating with me on this post. Marvel Universe LIVE! in Toronto + Giveaway! What a great opportunity.. Would love to treat the family! Thanks for the chance to win. I want to win! I want to win so we can take our daughter and son inlaw. They just moved back to Ontario from Calgary where they have been living for the past 10 yrs. I want to win! 🙂 Thanks! I know my parents have wanted to go forever. thanks for the contest! I WANT TO WIN! 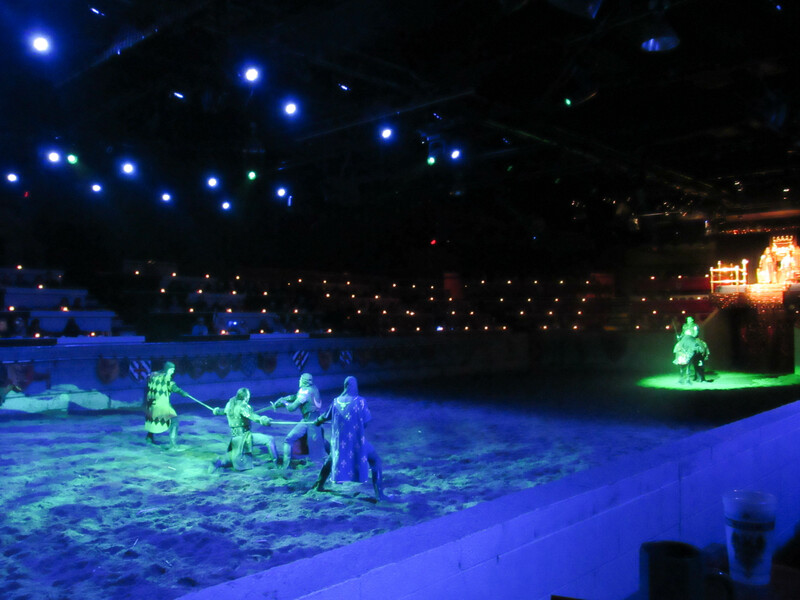 This would be fantastic and fun to go and see a show. Spring Bedding Refresh From HomeSense! Need a dress for New Years Eve? Check out my Forever 21 Picks! 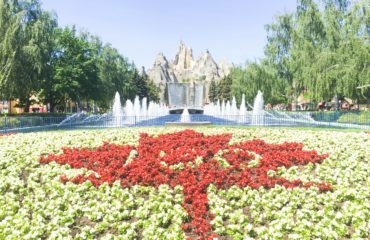 Our Visit to Canada’s Wonderland!